Britain and Turkey have exchanged blame over who is responsible for allowing three London schoolgirls to travel to Istanbul, en route to join Islamic State (also known as ISIS or ISIL). British police said on Tuesday they believed the girls have now crossed into Syria with the help of people smugglers. “Officers ... leading the investigation into the three missing schoolgirls from east London, now have reason to believe that they are no longer in Turkey and have crossed into Syria,” police said in a statement. UK police denied a claim from Turkey it took three days to tell Ankara about the missing East London schoolgirls. 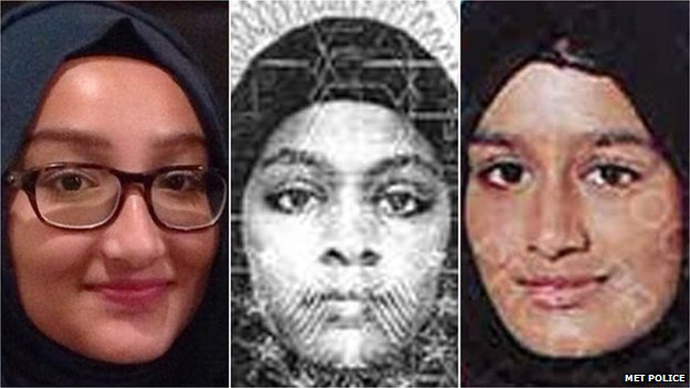 A statement issued by London’s Metropolitan Police said Turkey was informed within 24 hours of the disappearance of Shamima Begum, 15, Kadiza Sultana, 16, and Amira Abase, 15. Turkey’s Deputy Prime Minister, Bülent Arınç, criticized Britain on Monday for taking too long to notify the authorities in Ankara. “It is a condemnable act for Britain to let three girls ... come to Istanbul and then let us know three days later ... They haven't taken the necessary measures,” he said. Turkey said it needs faster and more detailed information from Western intelligence agencies to intercept suspected IS recruits. In a statement issued on Tuesday, the Met refuted Arınç’s claims. “Since then we have been working closely with the Turkish authorities who are providing great assistance and support to our investigation,” the statement read. British police and intelligence agencies have already come under criticism for failing to notice a public message one of the schoolgirls sent on Twitter to a known ISIS supporter. Two days before leaving the UK, Shamima contacted Aqsa Mahmood, a 20-year-old from Glasgow who fled to join IS militants in 2013. It has also emerged Shamima was following up to 70 Twitter accounts linked to IS extremists. Aamer Anwar, a lawyer for the Mahmood family, expressed “incredulity” that British police and security services failed to notice Shamima had contacted the known extremist. “We are aware from contacts with Special Branch and the police that her social media is regularly checked and regularly monitored,” he said. “The idea that a 15-year-old should make contact with Asqa, who is regarded as a terrorist, a member of [Islamic State], yet no action is taken. “The family of a young girl do not have the customary knock on the front door? “Surely families have a right to demand an inquiry in to what has gone wrong here,” he added. Questions have also been raised as to how the three schoolgirls were able to fly to Istanbul without rousing suspicion with border officials. Reports that Shamima traveled using her older sister’s passport were confirmed Monday. The girls boarded a Turkish Airlines flight from Gatwick Airport. Speaking on BBC Radio 5 Live, Leader of the House and former Foreign Secretary William Hague said it was unrealistic for security services to notice everything.